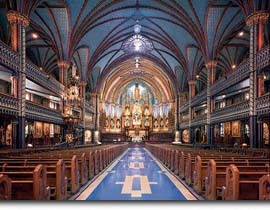 Notre-Dame Basilica was opened in 1829, making it the largest religious edifice in North America at the time. The Sulpicians chose a Neo-Gothic style, and assigned the task to a Protestant architect from New York, James O'Donnell. He later converted to Roman Catholocism so that he could be buried beneath "his" church! Behind the Basilica is the Sacred Heart Chapel, also known as the "wedding chapel." It was rebuilt in 1980 after a fire. The new chapel incorporates restored elements from the original 1888 decor and a contemporary bronze altarpiece by sculptor Charles Daudelin. The interior of the Basilica, redone under the direction of Victor Bourgeau in the 1870s (Bourgeau was also the designer of the Hôtel-Dieu storehouses), features finely sculpted polychrome wood decorated in gold leaf. Complemented sculptures by Louis-Philippe Hébert and Henri Bouriché, and a star-spangled vault, this masterpiece of decorative art attracts thousands of faithful worshippers and visitors every year. 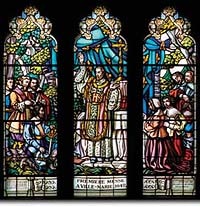 The Basilica's sacred art collection along with sculptures, paintings and stained glass belonging to the Basilica and Chapel, all offer visitors an impressive selection of works from the 17th to 20th centuries. Regular concerts, occasionally accompanied on the 1891 Casavant organ and often televised, enhance the Basilica's important role in Montréal cultural life.